100 is the new 70 - Grace Ridge Retirement Community - Morganton, N.C.
Only 14 percent of Americans owned a bathtub and less than eight percent had a telephone. There were 144 miles of paved road in the U.S. and the speed limit in most cities was 10 mph. That’s no exaggeration. 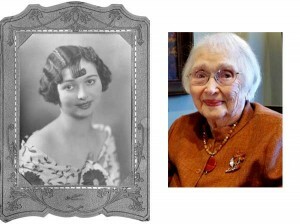 Ruby was 15 when women got the right to vote; 22 when the first talking motion picture, The Jazz Singer, was released; 35 when NBC aired the first network television broadcast; 64 when man walked on the moon; and 86 when the first website went live. Living to 110 is a feat on its own, but Ruby herself is somewhat of an anomaly. At 110, she’s entirely independent at living an active lifestyle at Grace Ridge Retirement Community. She knows more about NASCAR than most, alters her own clothes and still enjoys grocery shopping. A lover of crossword puzzles, Ruby has a wealth of knowledge and continues to share it. In fact, she attributes her longevity and health to an active mind. Recently she recalled stories of her cousin Annie, who was a member of the first Women’s Army Corps (WAC) in World War II. She explained how WACs were the first women, aside from nurses, to serve with the Army. While many can’t even imagine living to 110, it’s not difficult to think of residents here who have celebrated 100+ birthdays. Not that this is a place where people go when they “get old.” The ages of residents span a nearly five-decade range. And many have thrived at Grace Ridge for 20-30 years! Research shows that seniors who live in active retirement communities like Grace Ridge tend to have higher life expectancies. There are several reasons attributed to this: increased opportunities for socialization, mental stimulation and physical exercise to name a few. Even so, there seems to be something particularly special happening at Grace Ridge. Perhaps it’s the overall attitude towards retirement. Studies have shown positive perceptions of retirement can have a profound impact on life expectancy. And there’s always something positive happening here. After all, our Good Moods at Grace Ridge program fosters total wellness of mind, body and mood. Whether taking a fitness class, learning a new hobby, hiking nearby trails or volunteering with friends, there are plenty of opportunities to stay active and enjoy a fulfilling life. Whatever the reason, the lifestyle at Grace Ridge does certainly seem to lend itself to living a longer, healthier and more active life.